(From Sony lens literature) Sony has announced two new high-performance ZEISS® lenses zoom lenses -- a standard zoom and a wide-angle zoom -- for its α A-mount system. Designed for professionals and high-end photo enthusiasts, the new Vario-Sonnar T* 24-70mm F2.8 ZA SSM II (model SAL2470Z2) standard zoom and Vario-Sonnar T* 16-35mm F2.8 ZA SSM II (model SAL1635Z2) wide angle zoom lenses deliver significant improvements in image quality, ghost reduction and AF performance over their predecessors and add a rugged dust- and moisture-resistant design. The new zoom lenses are ideal partners to Sony's α A-mount family of interchangeable lens cameras, including the highly acclaimed a99 and a77 II models. With the addition of an optional mount adaptor, they're also compatible with a E-mount cameras such as the a7 series. The new Vario-Sonnar T* 24-70mm F2.8 ZA SSM II and Vario-Sonnar T* 16-35mm F2.8 ZA SSM II models achieve legendary ZEISS image quality thanks to ZEISS T* coating on their optical surfaces that minimizes ghosting and flare plus aspherical and ED (extra-low dispersion) glass elements that suppress aberration and minimize distortion. Additionally, the new models feature enhanced AF capabilities compared to their predecessors, delivering approximately 4x the subject tracking speed thanks to their SSM (Super Sonic wave Motor) system and faster, more powerful processing in the lens LSI. This advanced AF performance makes the new lenses an ideal complement to the impressive 4D focus system on select a camera bodies like the a77 II model, and a great choice for shooting fast moving subjects like sports, wildlife or young children. The new Vario-Sonnar T* 24-70mm F2.8 ZA SSM II (model SAL2470Z2) standard zoom and Vario-Sonnar T* 16-35mm F2.8 ZA SSM II (model SAL1635Z2) wide angle zoom lenses will be available this June for about US$2,100 and US$2,250, respectively. 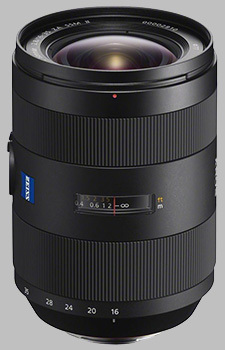 The Sony 16-35mm f/2.8 ZA SSM II Zeiss Vario-Sonnar T* SAL1635Z2 doesn't have any user reviews yet!